Spend some time in Spain’s great outdoors! Engines at the Ready… Go! 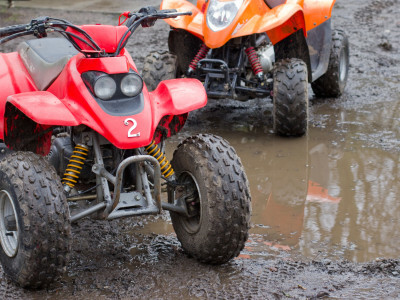 If your hen is the adventurous type with a love for speed and powerful vehicles, then this quad biking activity will tick all the boxes as an amazing event for her hen do in Barcelona! You and the girls will get together to enjoy one hour of fun, holding on tight to the handlebars of your bike as you drive around some of Spain’s best quad biking landscapes! As you have a single bike each, you can really focus on doing things at your own pace, with no pressure! The fresh air and time outdoors also works wonders for hangovers after a lot of sangria! Everyone participating must have a driver’s license. The price of gear and insurance is included in the cost of the activity.